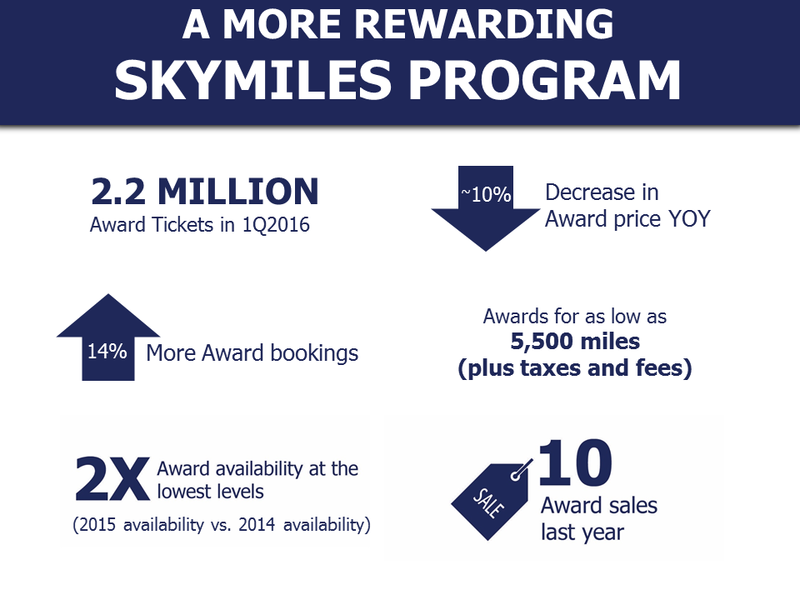 Delta SkyMiles members drove a record-breaking first quarter for 2016 as they took advantage of Delta’s Award program and redeemed miles for more Award seats at lower levels. Members redeemed miles for more than 2.2 million Award trips in the first three months of the year, or about one Award every 3.5 seconds, making it the best quarter of Award redemptions on record. Even better for SkyMiles members, the average mileage redemption amount per ticket was down approximately 10 percent versus last year. Delta offered 10+ Award sales in 2015 and is continuing the trend this year with recent Award sales to Europe, Canada and across the U.S. In connection with these sales, SkyMiles members have been able to redeem miles for as low as 5,500 miles one way (plus taxes and fees) to numerous domestic destinations, helping drive the record first quarter results. Zachary discussed these redemption records as well as other SkyMiles highlights when she delivered today’s keynote address to customers, media and industry experts at the Flightglobal [email protected] Conference in Las Vegas.